The Apollo IE Will Be Powered By A 850-HP Ferrari V12? Could this turn out to be true? Late last week, of its upcoming track-only, V12-powered IE (previously called Titan). What we can confirm is that the stunning Apollo Arrow Concept, first shown at Geneva in 2016, serves as the design basis. Of course , but, generally speaking, that’s the design language. Today, is claiming that V12 will be a Ferrari naturally aspirated engine, producing around 850 hp. Honestly, that’s not the engine, or rather its source, we were expecting. We reached out to Apollo as well and our source could neither confirm nor deny this rumor. We still have our doubts, however. Ferrari isn’t known for allowing other carmakers to make use of its engines, unlike, say Audi or BMW (a BMW V12 powered the McLaren F1, for example). further speculates this Ferrari V12 probably comes from the LaFerrari, although without the electric boost technology. Only 10 Apollo IEs are planned priced at €2 million a pop, with each car coming with a driver training program to be held at Europe’s finest race tracks. Ferrari, McLaren, and Aston Martin offer similar programs for their own track-only machines, the FXX K, P1 GTR, and Vulcan, respectively. 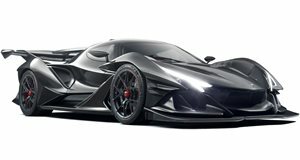 Apollo is working exclusively with Italian engineering firm Manifattura Automobili Tornio (the previous partnership with Scuderia Cameron Glickenhaus has ended) to develop the IE along with the road-going version, which will be powered by a twin-turbo V8, or so we last heard. In any case, we’ll have answers later this month when the Apollo IE is unveiled in London.